Often, when people contact me for help, they ask me what is the best breed of dog to get for first time pet-parents. Over the last few years I am tending more and more towards recommending our ubiquitous little Indian Dog that, in my last post, I had suggested we call The Naaty. Given the Desi flavor and fervor of August, I’m thinking I too will stick to the theme of ‘Indian Dogs’ for this month. So this post is about what makes the Naaty such a great pet. Here are my top reasons for preferring and recommending the Naaty to pet parents, particularly first time pet parents. 1. They come in a Fun Size: I often stand at the gym, stare at the 10kg dumbel mustering the courage to lift it, only to chicken out and stick to my colourful neoprene-coated lighter dumbels. And then I pray that my 40kg dog does not fall sick when my husband is not in town! Nope, this is not a hypothetical situation. However, the last time it happened, my Nishi was a puppy and I could manage. Today she is a fully-grown big boxer weighing 40kgs, full of muscle. And I am hardly one and half times her weight! Apart from planning for sick days, training deficiencies are also to be factored in. Despite best of training, there are exigencies that we can never predict. During the peak of Nishi’s training, she had a nasty accident. She was in and out of hospitals. She took a year to recover physically and another to recover emotionally. Her training has had a break of 2 years! Fortunately, I have access to a wonderful support system to jumpstart her training again. Not a luxury most have. A friend’s dog was missing for three months during his crucial socialisation period, making him completely clueless on how to deal with humans. Some people who seek my help have had lousy trainers. One way or the other, having a large dog that is training deficient is always harder than a small one. Having a smaller dog, helps give ourselves room to recover from our errors and restart training and regain harmony. And the added perk is that I get to pick up the little one when she wants a cuddle. So, you see….fun size! 2. They are low maintenance: I had the good fortune of spending a day assisting my friend, a dog groomer, who owns a salon for dogs. We groomed a Cocker Spaniel, A Retriever and a Labrador. After that experience, I’m not saying I would not do this for my dogs, if I had to. I’m just saying that I’d like to avoid it, if I could. Most times I sport ugly chipped nails because I don’t manage to haul myself to the parlour for a mani-pedi. I like low maintenance that way. Naaties are not just low maintenance aesthetically. There’s more. Recently, at a friends place, I mentioned that my boxer is lactose intolerant. There was some heavy guffawing and it was the conversation of the evening. But, it’s no laughing matter really, when you think about it. Modern day pedigrees, bred of “champion line dogs” come with a host of health issues that one could easily observe by looking at increasing crowds outside veterinary clinics. While our fancy pooche’s dietary requirements get more stringent, our little naaty happily polishes off a Paneer Butter Masala, licks her lips and scampers off with not a worry in the world and returns the next day, bright eyed and bushy tailed as ever! In our own home, Nishi, my boxer, visits the vet enough for her to have friends all along the route. Tigger, my naaty has not had to visit the vet once since we got her. 3. Teachers pet: That’s what Tigger’s nametag says. Because she is! She is a dream to train. She is alert, quick to learn and has a good attention span. She enjoys training time and over all, it’s such a joy. While I love Nishi to bits, she has been one of the most challenging dogs to train ever! Constantly in her own world, close to non-existent attention spans and easily distracted. A friend recently used a term that fits her perfectly – Space Cadet! Someday I’d like to share a video of the two girls in a session. By the time I get Nishi to obey 1 command, Tigger has demonstrated everything she knows – thrice! She’s smart! Period. 4. Alert and cautious: Just what I need. She makes the perfect ‘alert’ dog. She alerts me at the slightest unfamiliar smell or noise. After having done that, she conveniently disappears from the scene. Naatys are rarely confrontational. They alert and their job is done. This, to my mind is perfect. Imagine a dog that wants to head out and take on fights. What if such a dog decided that your neighbours grocery bag posed a threat to you or your landlords cat was evil! I believe in having pets without inconveniencing others to the best of our ability. So, I quite like this arrangement where she alerts and then I take charge. Pet dogs are not meant to guard. Security guards are ment to guard. People are meant to guard. We need to guard ourselves and if possible our dogs too. Thus the term “guard dog” is a bit misleading. More precisely, it should be “alert dog”. 5. Independent: Naatys have an independent streak. My own Tigger is an exception to the rule. But most Naatys are a bit aloof, NOT to be mistaken with non-affectionate or dis-loyal. However, this independent streak has one immense advantage to young working couples. Such dogs are less likely to develop behavioural issues like separation anxiety. A mentally healthy dog is a happy dog. 6. Fit as a fiddle: A physically healthy dog is also a happy dog. And naatys are among the healthiest dogs, with no known proclivity to any genetic disorder. Compare that to any other known breed. This site lists the known disorders of most known breeds. Naatys, unlike these breeds, were not bred by humans. So no human folly in their genetic makeup. Remember biology – remember how natural selection results in survival of the fittest? That’s your naaty for you – naturally selected to be the fittest. I kid you not! They are tough! Their lifespans are long. Fewer vet visits. Lesser expenditure. Lesser heartache. 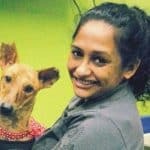 Seeing your pet suffer through an illness, with no means to explain to your pet why she is suffering is one of the hardest thing a pet parent has to do. If there is anyway to avoid that, I’d prefer that, thank you very much! Now… having said all these lovely things about The Naaty, there are a few thing’s I’d like to share with you that, well, might come as unexpected surprises. 1. Not your Walt Disney Dog: No sireee. This dog is unlikely to jump up on all your guests at first sight and shower them with love. They are cautious and take their time with new people. 2. No, still not your Walt Disney Dog: This will not play endless hours of fetch. In fact, my Tigger does not even know how to play fetch. I am teaching her now. But I don’t know how far that training will go. Remember the Akita in the movie Hachiko? Remember the Japanese guy describe an Akita as a dog that does something only if he wants to and that he would not play fetch? You can think of your naaty to be a lot like that. Loads of oomph and attitude! 3. Not your red carpet dog either: Not considered glamorous. And why does that matter? Well, do I really need to answer that? When people discriminate against people, would dogs be spared? Makes me sad. But I look at things changing and I take hope. As I write this blog, I write with hope. I know there is hope. So! That’s my case for why The Naaty makes such a great pet. If you have experiences having adopted or fostered naatys, please do share them. I’d love to hear what you think of these dogs as pets. If I know anything about them, it’s that they are so diverse and so full of personality that each of you will have a rather unique specimen on your hands, each as delightful as ever. I can’t wait to hear from you. Used to be a breed fan, but after seeing all the issues with the breeding and what they go through for the sake of cuteness – look at the pug, such an unfortunate breed created to look cute but with so many issues – have been a convert. Please keep writing more often. Simply loved this one! Yes Sindhoor indeed it is a victory 🙂 Just the other day one of my neighborhood pal got another new lab puppy and while i was playing with him, he asked me why don’t I get a Lab puppy instead of Ind dogs. I was really taken aback for a while then I asked him, is there anything that your Lab can do which my Ind dogs can’t? That got him thinking. Then I gave him an hour long lecture why Ind dogs make such good pets 🙂 Finally he realized where I was coming from. I would never trade my babies for any breeds. I can go on and on about my fur-babies. The eldest (7yrs) and the most goofiest is Mickey-he is a male, Choco-white is colour. He is the trouble maker, knocks everything around the house, loves open spaces and is also a certified escape artist. Awesome with kids, he is neighbors darling, interested to eat in my neighbors house than his own and crazy about eating oats with banana and milk. Then comes my Princess Poo-Poo (6yrs) she is fawn and she rules the house. She is very girlie and super smart sindhoor, like Tigger she understands every command. She is my shadow, follows me everywhere around the house. she is bed hogger, and does not trust people easily unlike mickey. I had another one Jackie, but she passed away couple of years back. Btw have you noticed apart from being such a fun size, Naaties comes in various colours. Just look at my mickey he has such an unique adorable choco-brown white colour. Avantika, I know exactly what you mean. But for now I just focus on every new person who I can get to see how great they are and just enjoy that small victory for our Naaty 🙂 Take this blog for example. Just the fact that there is an audience that is reading this is such a great step forward right? What are the names of your Naaties and do share more on their unique traits. Would love to hear more. I cannot agree more. I have two of them and they are the best. They are intelligent, lovable and sooper smart. Can give any ‘breed’ dogs their run for money. Yet I feel extremely sad when people discriminate them. When people asks me what breeds i have and i proudly say Ind dogs, immediately it is a ‘oh’ followed by a long pause. sigh….i wish people wake up and see these ‘naatys’ various talents!